Epona: 'Divine horse', is a goddess associated with horses. The centre of her worship was in Gaul, but devotional inscriptions and representations of her, in a number of different contexts, occur across Europe including at least one from Britain where it is likely she was also known as Rigantona. Epona (‘Divine Horse’) was principally worshipped in Gaul where it is known that roses were offered to her in stables. There are records of dedications to her across Europe, including, from Britain, a bronze statuette which features her sitting and holding a yoke to identify her connection with horses and also some ears of wheat which is the other common feature of her depiction. On either side of her are ponies, a mare on her left and a stallion on her right, each facing the wheatsheaf. Here her equine nature goes with her depiction as a goddess of fertility and plenty. Depictions of her in stone, bronze and terracotta for the most part date from between the First and the Third centuries. We know she was one of the array of deities acknowledged in the Roman Empire with a feast day of 18th December assigned to her. Although the main area in which these depictions are found is in Gaul, they are also found as far south as Spain, eastwards across Germany and as far as south-east as Bulgaria as well as in Britain. The most common are those where she is mounted side-saddle and are mainly found in central and northern Gaul and in Germany. There is a sub-group among this type where she is accompanied by a foal found around the French town of Autun (Roman Augustodunum, Gaulish Bibracte) and also a few from this area where she sits astride rather than side-saddle. 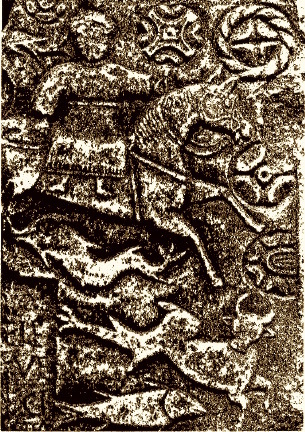 The other main aspect of her depiction is where she is shown with a horse on either side of her, either facing away from her (mainly along the Rhine) or towards her (examples from along the Danube, Italy, Spain and Britain). In images of her on funeral stele she is shown leading the way into the Otherworld. Here she also functions as a psychopomp holding the key to the gateway to the lands of the dead.